It's been eight long years since Duke last saw his human. Even with all that time spent apart, however, the bonds of love were never broken. But that's just the way things go between two best friends. Back in 2007, when Duke was still just a puppy, he was stolen from the backyard of the house he shared with his happy companion, Joshua Edwards, in Florida. Over the months that followed, Edwards searched high and low for his missing friend to no avail, reported the Miami Herald. It seemed as though the dog he loved so dearly was really gone forever. That all changed last week when Duke was discovered, dirty and alone, walking near a Miami roadway. He was taken to an animal clinic. 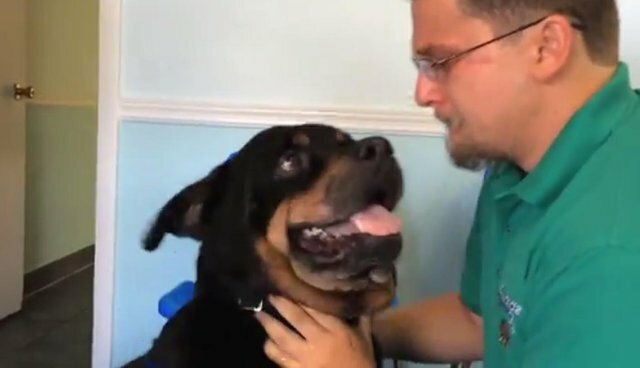 There, vets were able to find out who he was via a microchip identifier Duke had been given years earlier - and soon Edwards got the call that his long-lost friend had been found. "I have my dog back," says Edwards in this footage from their tearful reunion. "I'm so grateful."